TRAVEL & ENTERTAINMENT: CenterREP�s �Mamma Mia!� Is a Rockin� Musical Delight! Center Repertory Company�s theatrical season at Walnut Creek�s Lesher Center for the Arts (1601 Civic Drive) recently opened with a resounding staging of the popular musical �Mamma Mia!�, currently playing through October 7. Seriously, is there anyone who likes the music of ABBA who wouldn�t like this stage production? I think not! While there is such pleasure in hearing one�s favorite ABBA tunes sung into a narrative in rather preposterous ways, with lyrics to Dancing Queen insisting that �you can dance, you can jive,� the real pleasure is how the show is presented by such a talented ensemble cast. The trio of Lynda DiVito (Donna), Alison Quin (Tanya), and Leanne Borghesi (Rosie) light up the stage with their collective singing prowess, comedic talents, and overall flair and energy. They are a collective delight! Others in the cast who deserve standing accolades include Noel Anthony (Sam Carmichael, one of Sophie�s potential dads) for his wonderful singing voice, Giana Gambardella (Sophie) for her overall acting and singing talents, John Ditto (Pepper) for his dancing style, as well as convincing actors Mark Farrell (Harry Bright, another of Sophie�s potential dads) and Keith Pinto (Bill Austin, the third of Sophie�s potential dads). The creative team is outstanding, led by Director Marc Jacobs, Music Director Brandon Adams, Choreography Robyn Tribuzi, Scenic Designer Kelly James Tighe, and Costume Designer Maggi Yule. Set on a colorful Greek island, the plot serves as a background for a wealth of ABBA songs. A young woman about to be married discovers that any one of three men could be her father. She invites all three to the wedding without telling her mother, Donna, who was once the lead singer of Donna and the Dynamos. In the meantime, Donna has invited her backup singers, Rosie and Tanya. As complications ensue from misunderstandings, Sophie and Sky's (Sean Okuniewicz) wedding and relationship may be jeopardized, while, finding what is truly in their hearts, many may discover the course of true love. CenterREP really knocks this high-energy stage production of �Mamma Mia!� out of the park, accentuating fun and celebration, and therefore, is not to be missed! For tickets or more information please phone (925) 943-7469 or visit www.CenterREP.org. 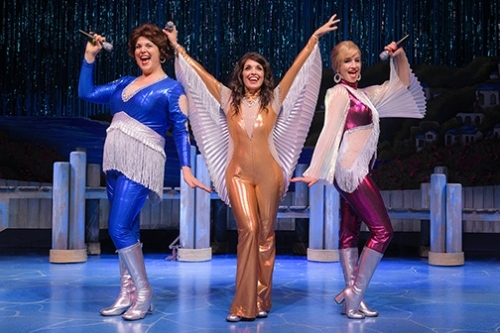 Photo caption: Leanne Borghesi as Rosie, Lynda DiVito as Donna, and Alison Quin as Tanya star in CenterREP's "Mamma Mia!"